At Verma Cosmetic & Family Dentistry we understand that children are often apprehensive and anxious about their dental appointments. We go to an extra effort to create a dental experience that is fun and non-threatening. Our staff has the training and understanding to create a gentle and safe environment to meet the special needs of children. We offer different options of sedation should the need arise that your child requires dental work to be done to restore their oral health. Often, if extensive fillings or caps are required to restore health to a child’s teeth, it is easier to use sedation. This allows the treatment to be done with a minimal amount of trauma for the child during the experience. Prevention is always our goal with all of our patients and especially our patients who are children. There are many things you can do with your child to establish healthy oral habits that will last a lifetime. Ideally you should begin creating these healthy habits when your child is still an infant. Around 6 months of age most babies will begin to get their baby teeth, or primary teeth. Baby teeth are important for eating, talking and smiling. They also have an important function in “holding the space” for adult teeth as they start to come in. When your child’s adult teeth begin to emerge it is very important that they are growing into a healthy mouth. Your baby’s primary teeth are important. Developmental stages that are directly related to your child’s future dental health depends on them. The best way to ensure the oral health of your child is to establish good oral hygiene habits early on and to begin consistent dental exams at the appropriate age. Below are some general recommendations to help establish lifelong good oral health habits for your child. Age 0-2: It is recommended that when your baby is a few months old you should begin to gently clean their mouth and gums with a soft cloth. This will keep their mouth clean as well as their baby teeth as they begin to emerge. There are special small, child-sized toothbrushes that you can use for your child as they start getting their primary teeth. Now is the time to establish good oral habits with your child. During this age range, of special concern is decay that starts when a child is allowed to fall asleep with a bottle or sippy cup with any liquid other than water. The liquid will pool around their new, little teeth allowing cavity causing bacteria to flourish. Do not allow your child to develop the habit of going to sleep with a bottle or sippy cup. This will often start a cycle of early decay in your child’s teeth. Age 2-4: At this age you should teach your child to use a toothbrush twice a day. Use only a pea sized amount of toothpaste and teach your child to spit the toothpaste out and not to swallow it. At this age you should introduce your child to the dentist. The best way to do this is to bring your child with you to your own dental exams. This is a fun and non-threatening way for your child to watch the dentist work. If your child is comfortable, the dentist could take a look in their mouth while they sit on your lap in the dental chair. Doing this a few times will help your child become used to a trip to the dentist and help ease them into having their own dental exams. Age 5-7: You should continue teaching your child to brush and floss daily, monitoring them to make sure it is done right. By this age your child should be having regular dental exams and cleanings. The dentist will also take dental x-rays during these exams to help detect any decay that is not visible on the outside of the tooth. Bitewings are usually taken once a year and a panoramic x-ray, which is an x-ray that allows the dentist to see your child’s whole mouth including the developing adult teeth, is recommend every 2-3 years. Sealants will usually be recommended as your child’s molars start growing in. Age 8-14: Your children should be having routine dental exams twice a year at this age. Sealants will be recommended for 2nd molars as they emerge. The dentist will also evaluate your child’s need for orthodontics at this age. If it is determined that orthodontics(or braces) are needed, they will usually be started during this time period. Encouraging and establishing good oral hygiene is very important as your child matures. And extra care should be taken with their oral hygiene habits if you opt for orthodontic treatment, or braces for your child. Age 15-18: You should continue ensuring that your child is having dental exams and cleanings every six months. It is important to remember to continue teaching and encouraging good oral hygiene habits in your child. Your child’s wisdom teeth will be evaluated in your child’s late teens, assessing whether they will need to be removed or not. An important element of good oral health is your child’s eating habits. As a general precaution, you should help your child steer clear of foods that are high in sugar and starches. A diet that is high in candy and treats of all sorts, plays a very big role in tooth decay. A diet that goes easy on treats, candies, sodas and juices combined with proper oral hygiene will go a long way to prevent cavities in your child’s teeth. 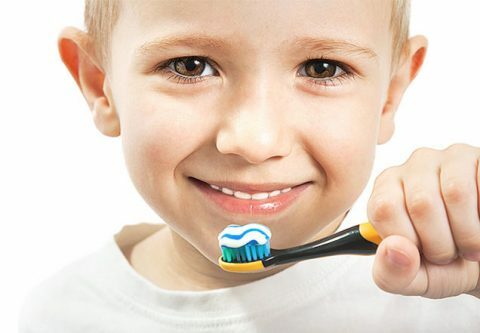 Use no more than a pea-size amount of toothpaste on your child’s brush. This offers adequate fluoride and protection from fluorosis, a damaging oral condition caused by over ingestion of fluoride. Help your toddler brush after breakfast and before bed. The American Academy of Pediatric Dentistry recommends that children under age eight brush with parents’ help. Call your community’s water department to find out whether your water is fluoridated, and talk to your dentist about the best fluoride for your child.